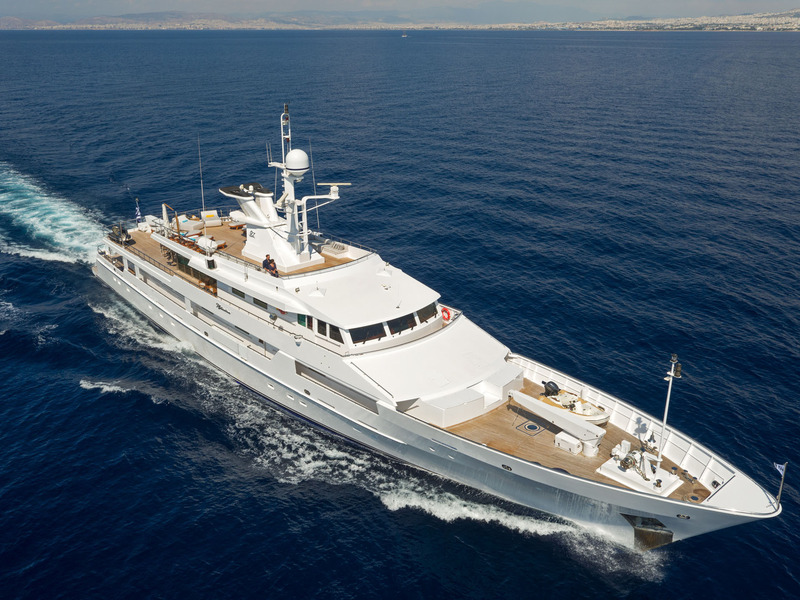 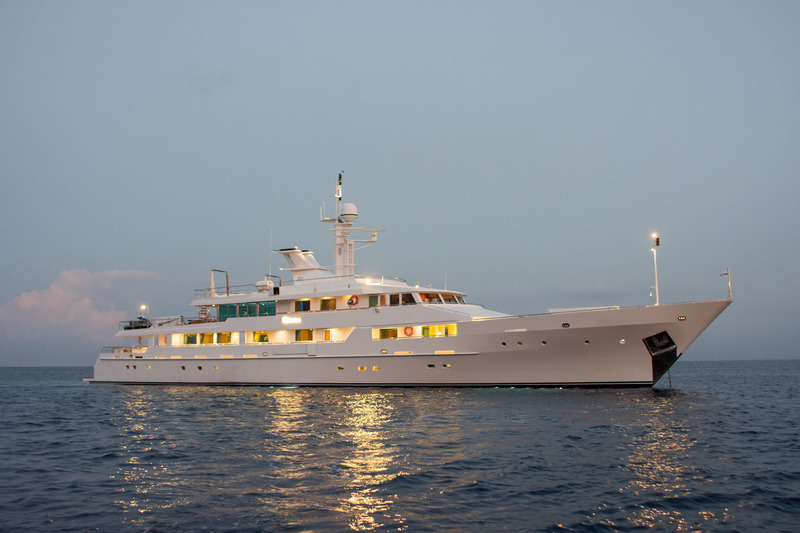 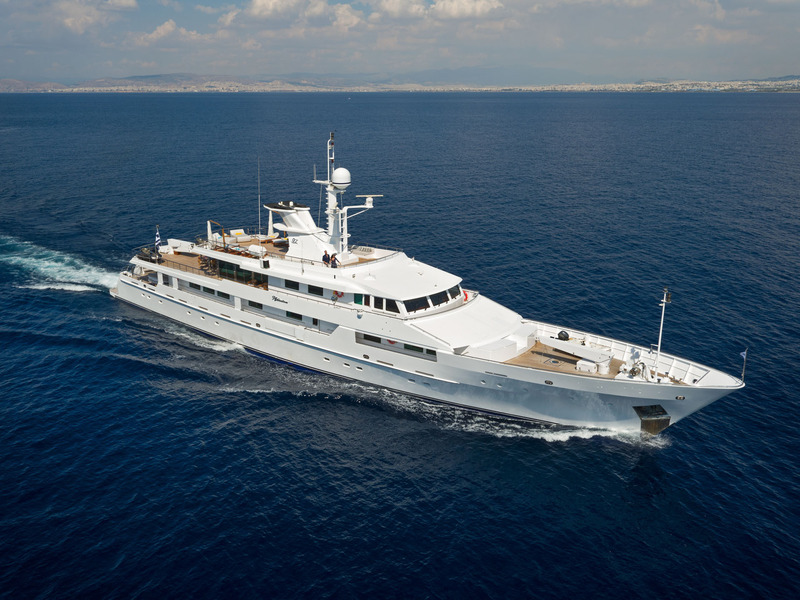 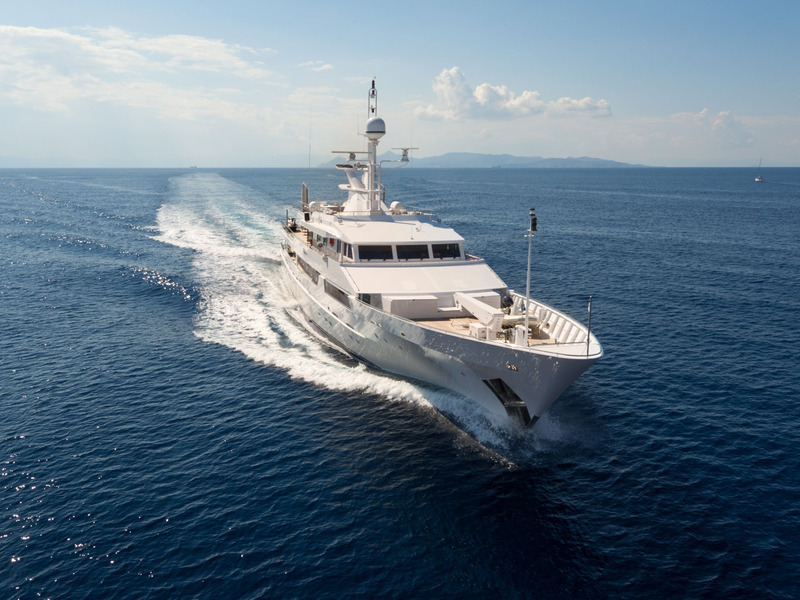 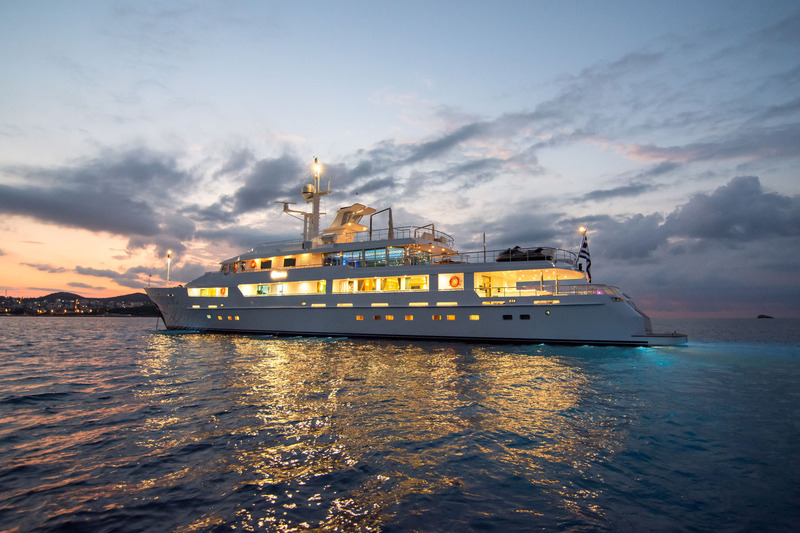 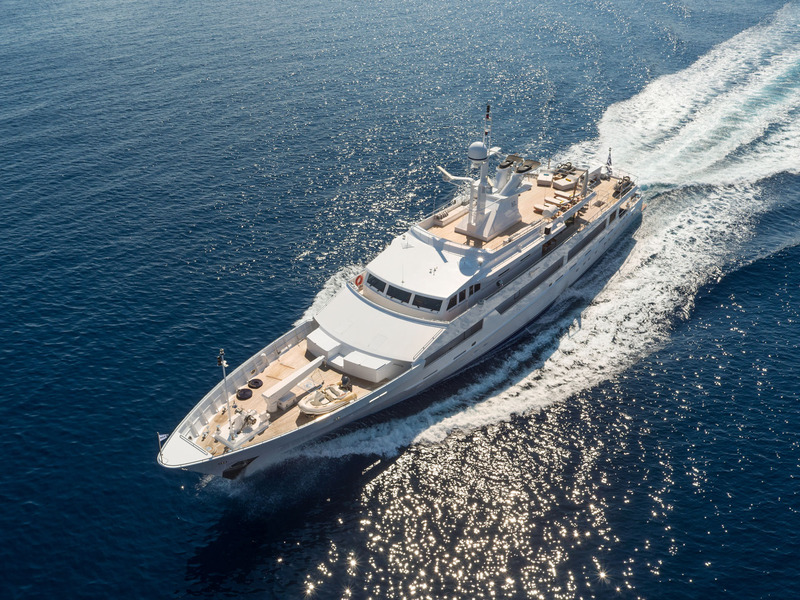 Built by Picchiotti Yachts in 1985 and last refitted in 2017, 56m/184ft superyacht O'NATALINA (ex.SWAYDA) is a classic vessel constructed with a steel hull and aluminium superstructure. 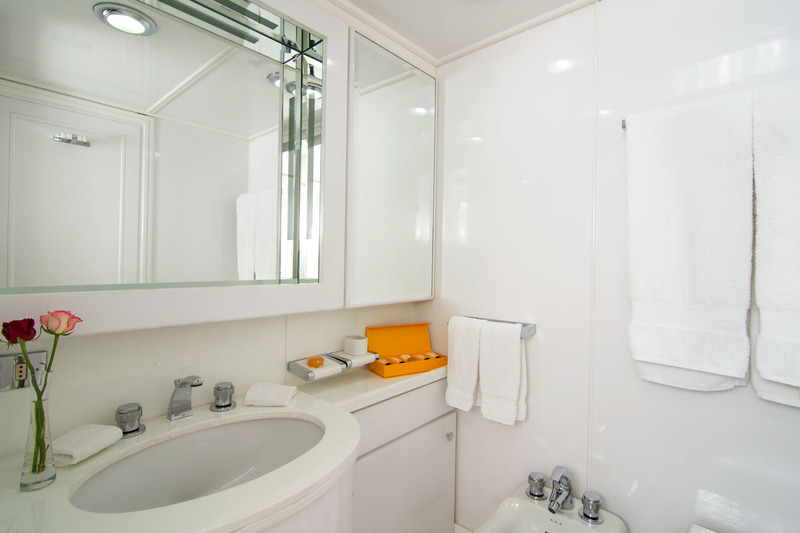 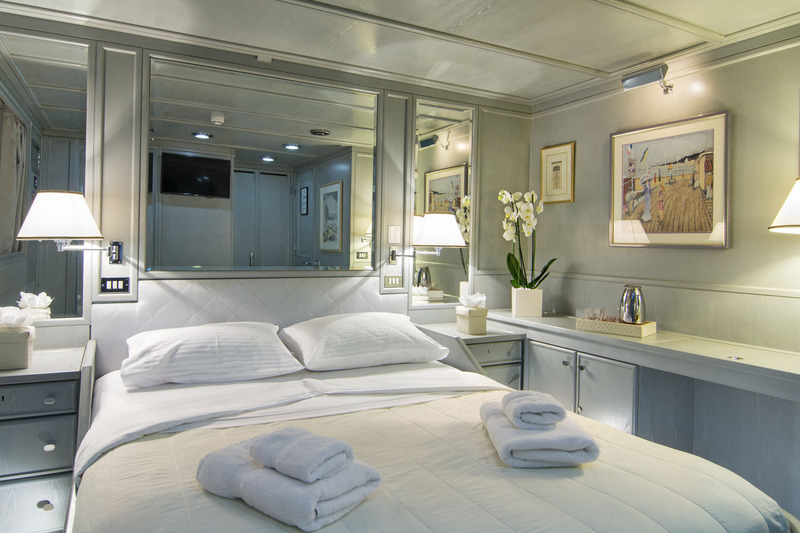 Her accommodation sleeps up to 12 guests over seven spacious modern cabins. 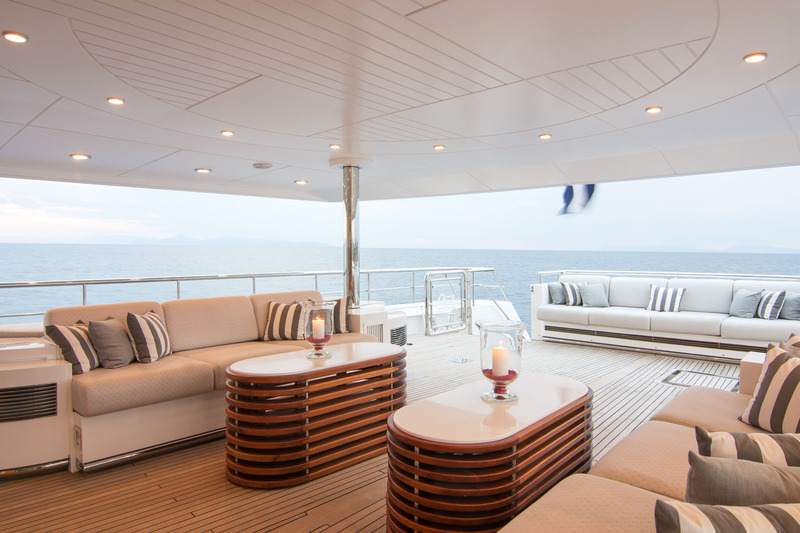 The lower deck has a spacious swim platform to use for sunbathing and as a place for guests to embark/disembark from the tenders. 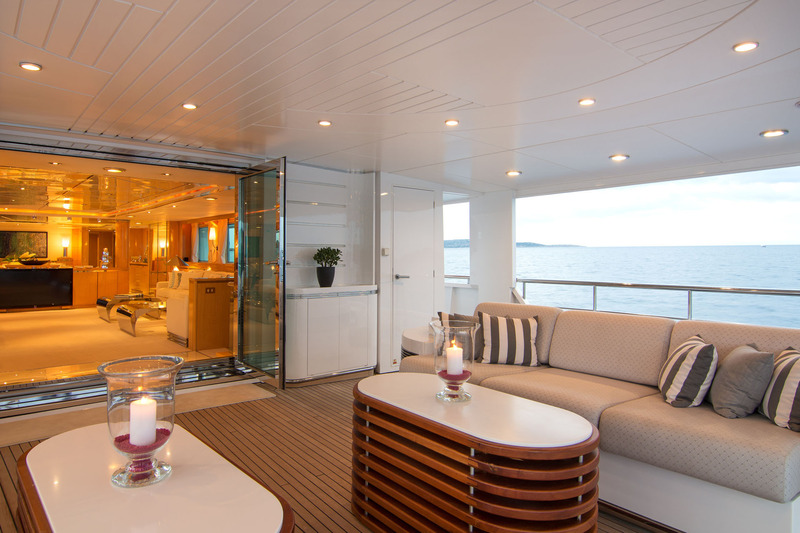 Two staircases lead up to the main deck aft, where there is a sun-exposed stern-side sofa and two elongated sofas in the shade. 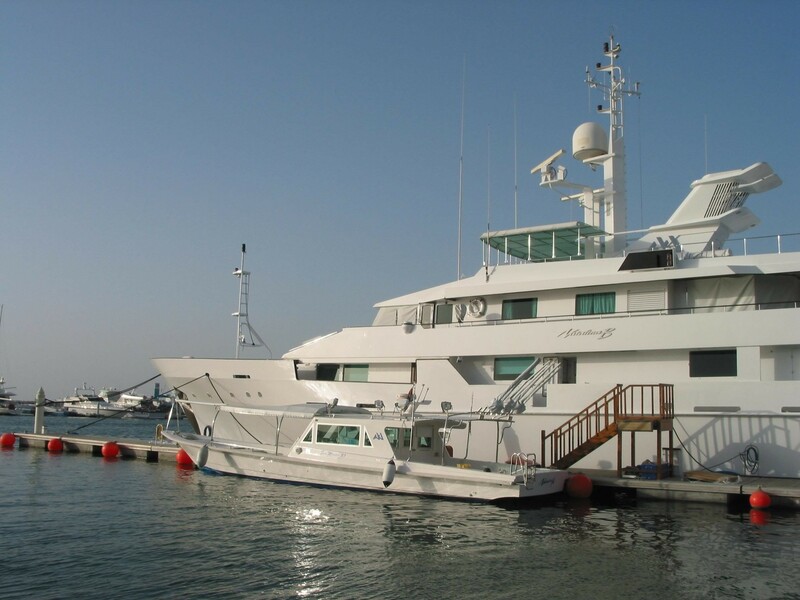 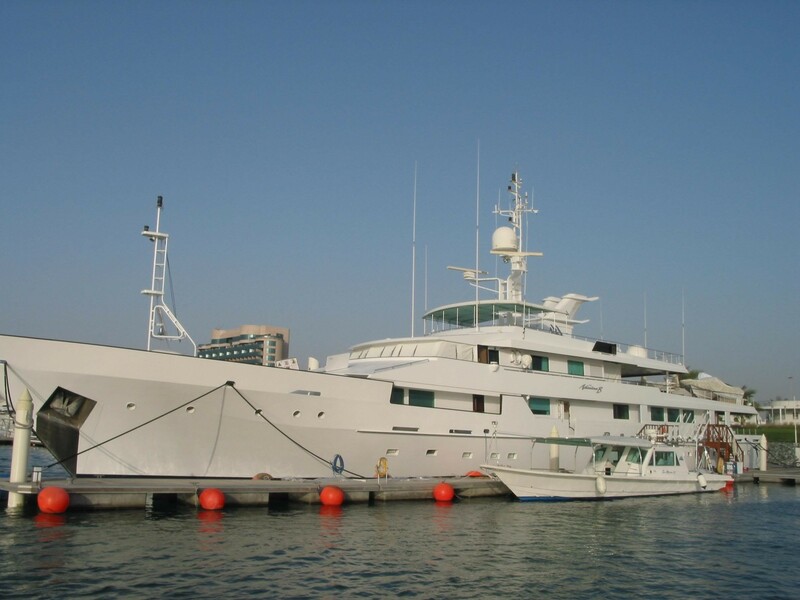 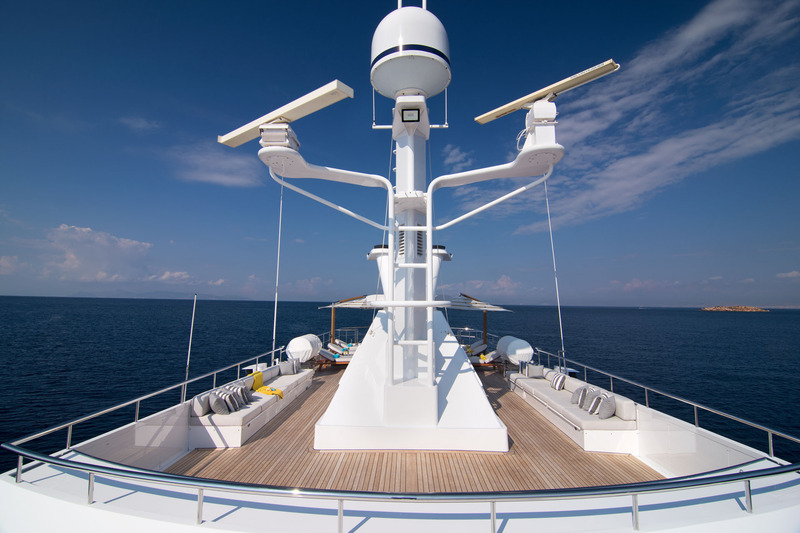 The bow area holds the tenders, which are launched and retrieved using a Davit crane, to leave space free in the stern for a beach club. 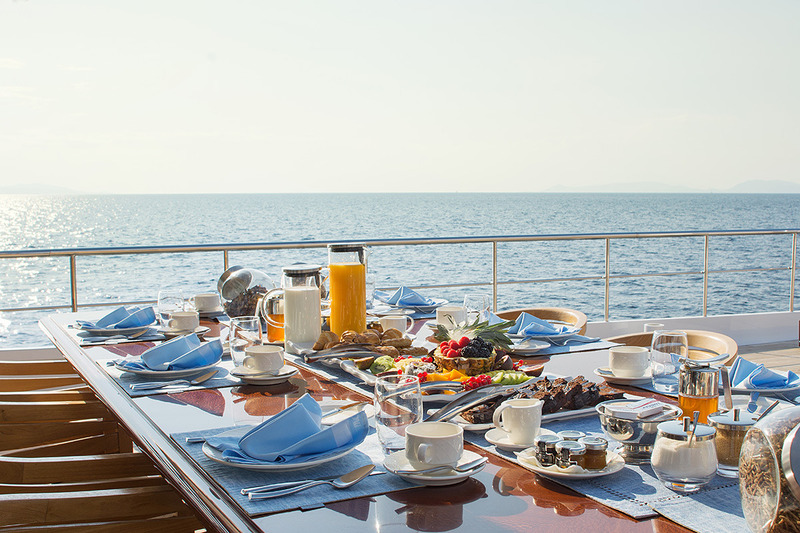 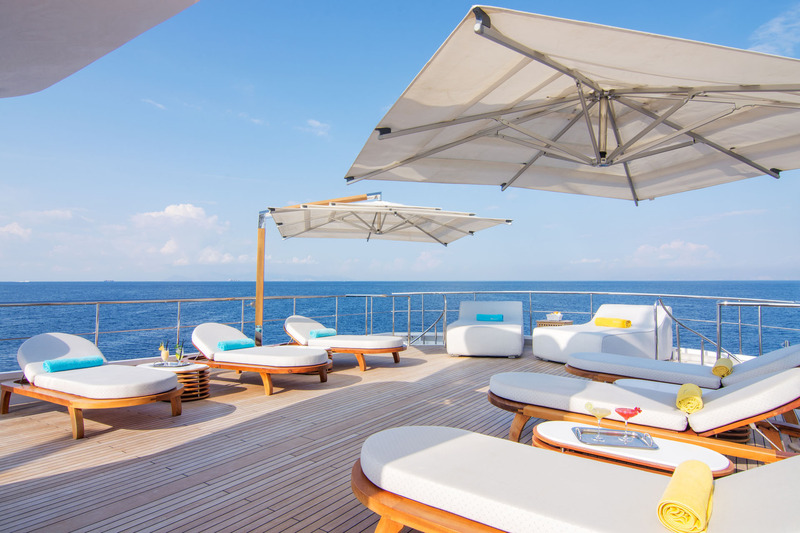 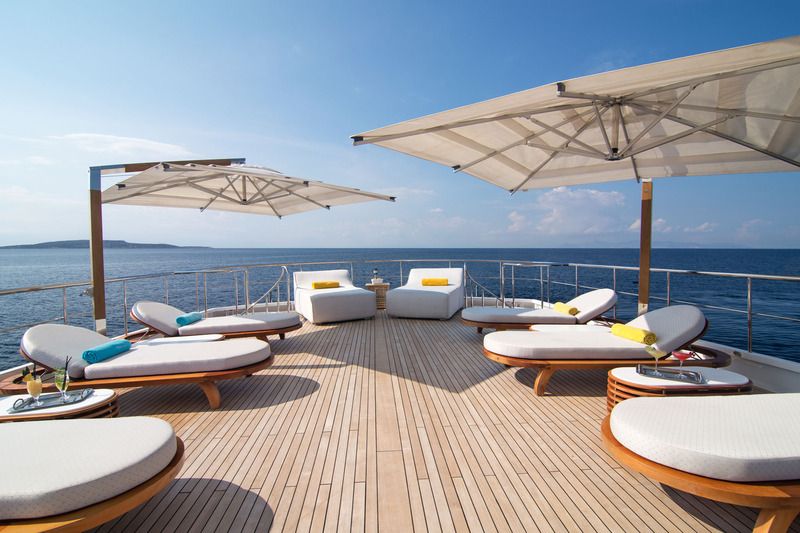 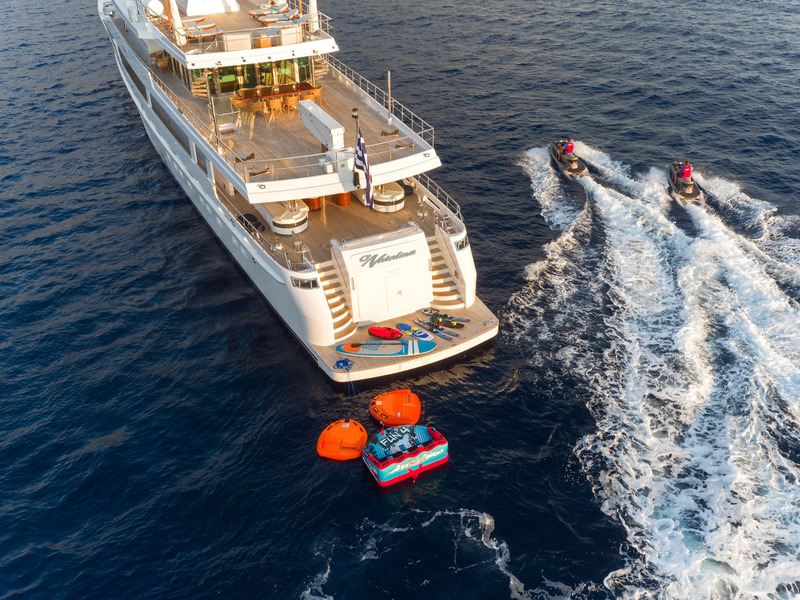 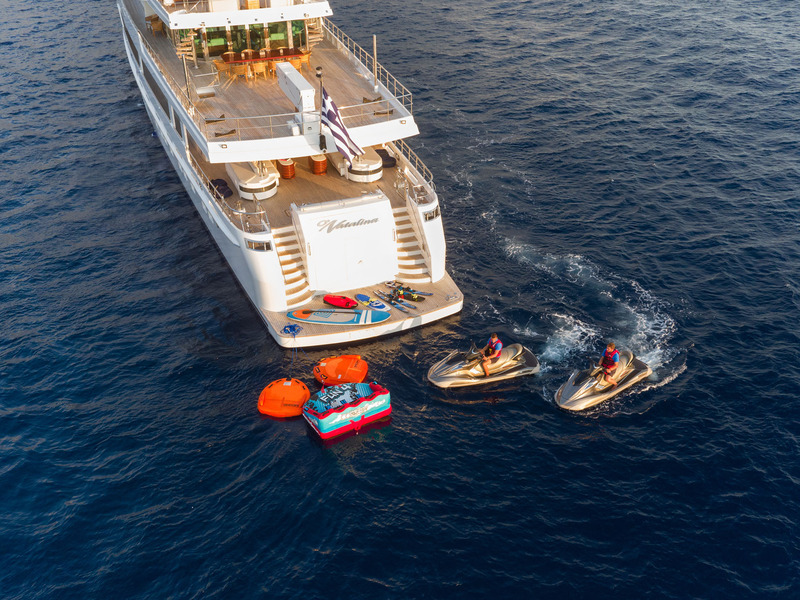 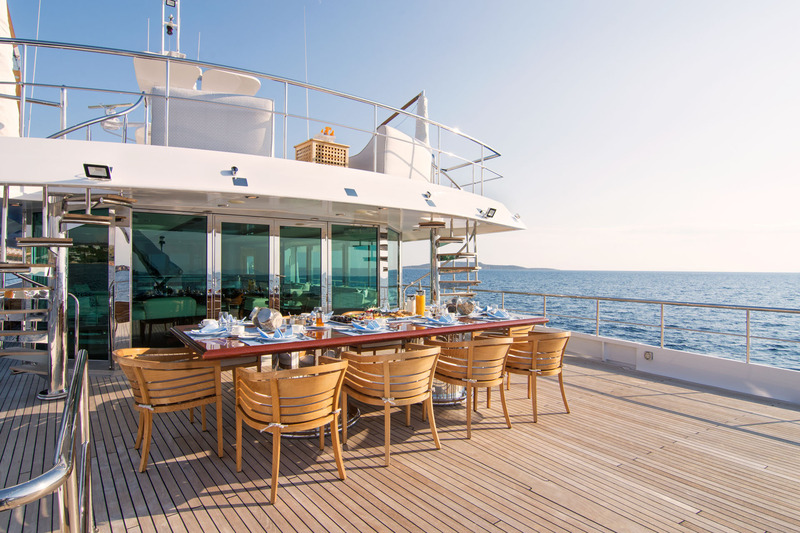 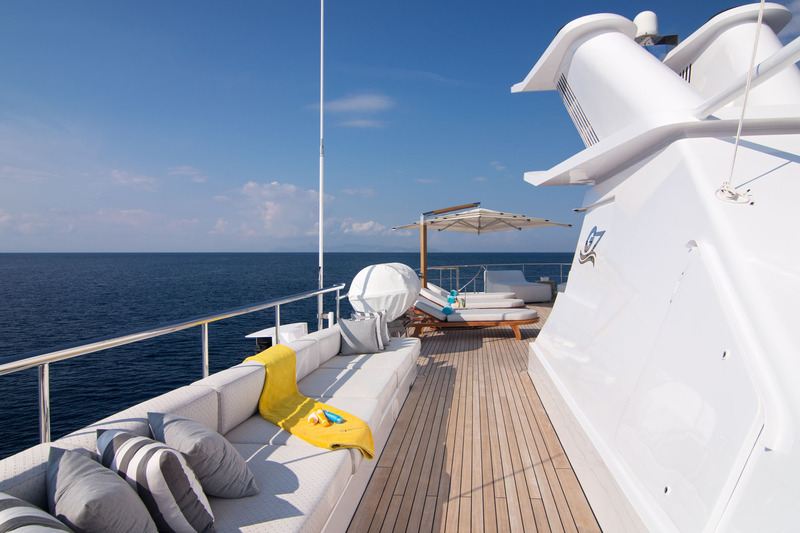 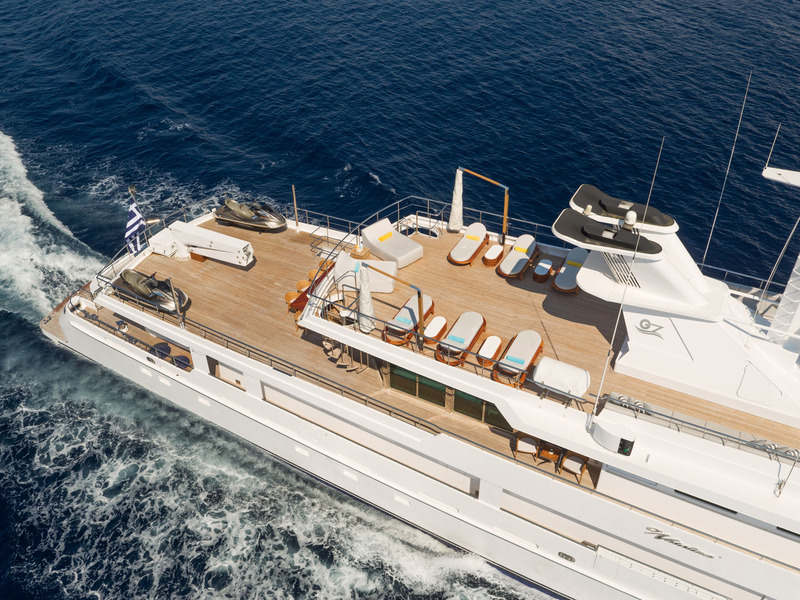 The stern section of the upper deck also hosts two jet skis either side of a Davit crane, while father forward the area is designed for guest use and contains a large alfresco dining table to seat up to 12 guests. 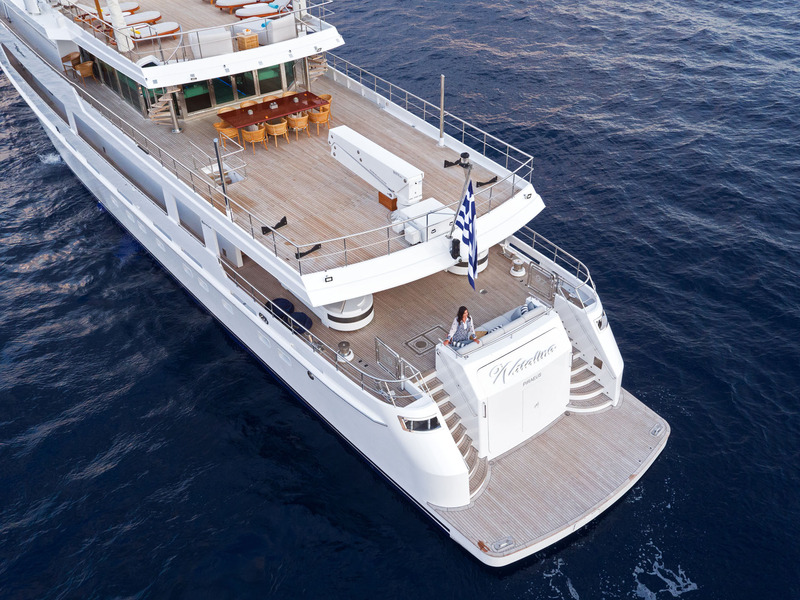 Two staircases connect up to the sundeck aft, which is laid out with six single sun loungers and two double sun loungers along the stern. 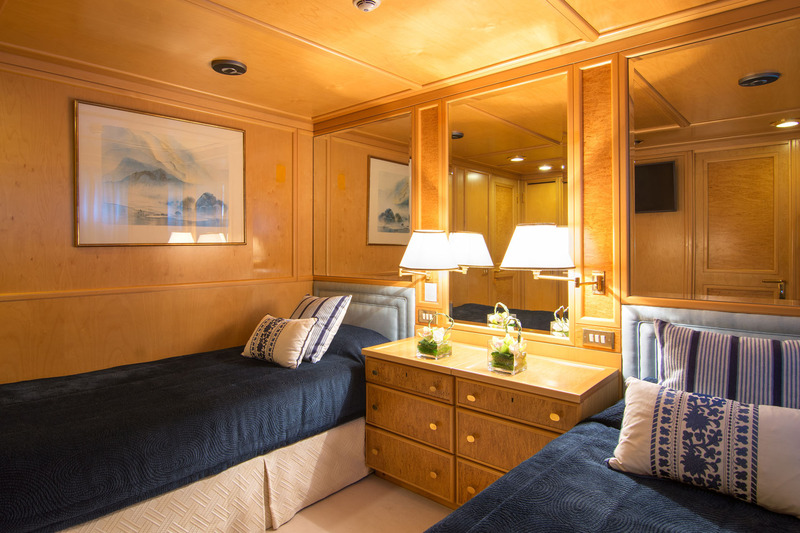 The forward deck space is completely clear, making the perfect area for fresh air exercise and observation. 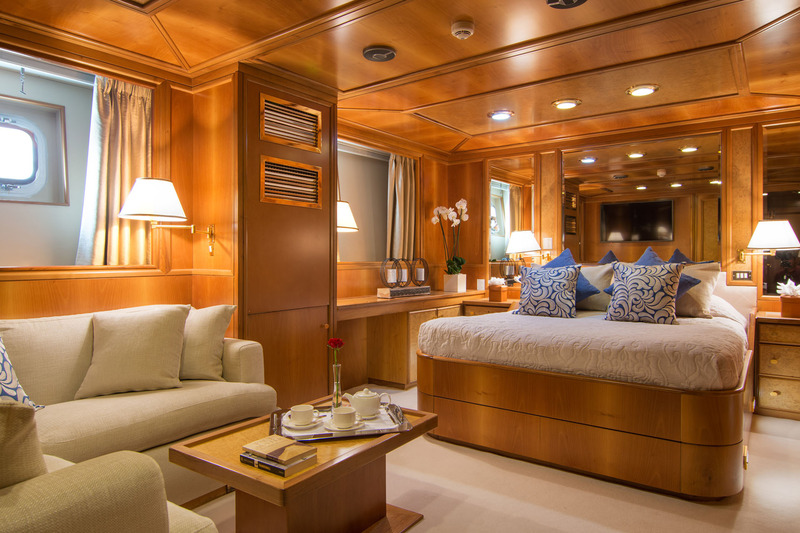 The main deck salon uses pale wooden panelling with furnishings in pale white and accents in blue and sea green. 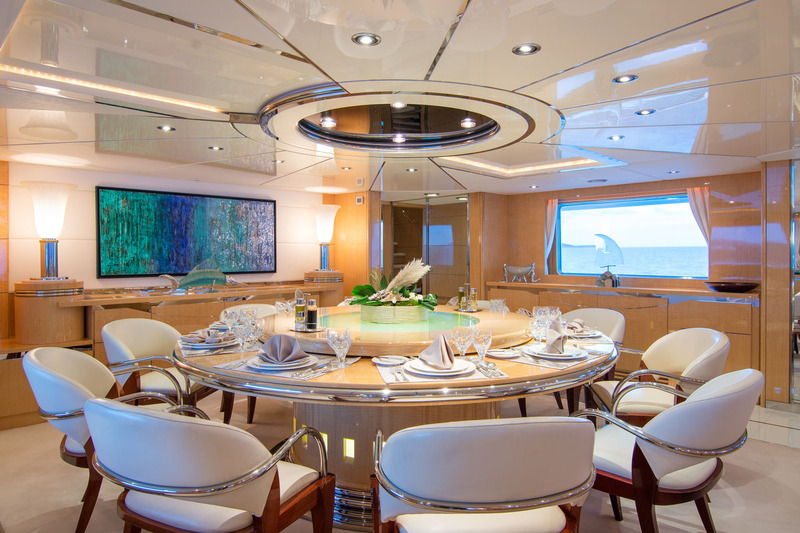 The forward formal circular dining table seats up to 10 guests in contemporary surroundings. 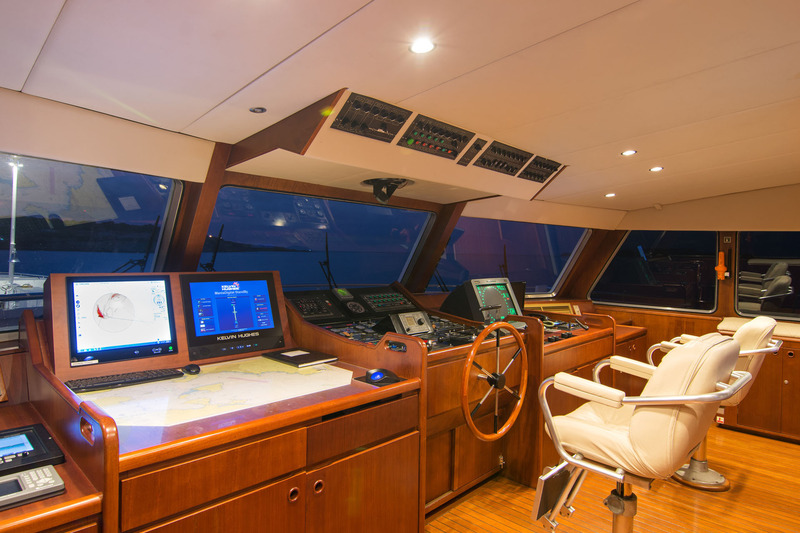 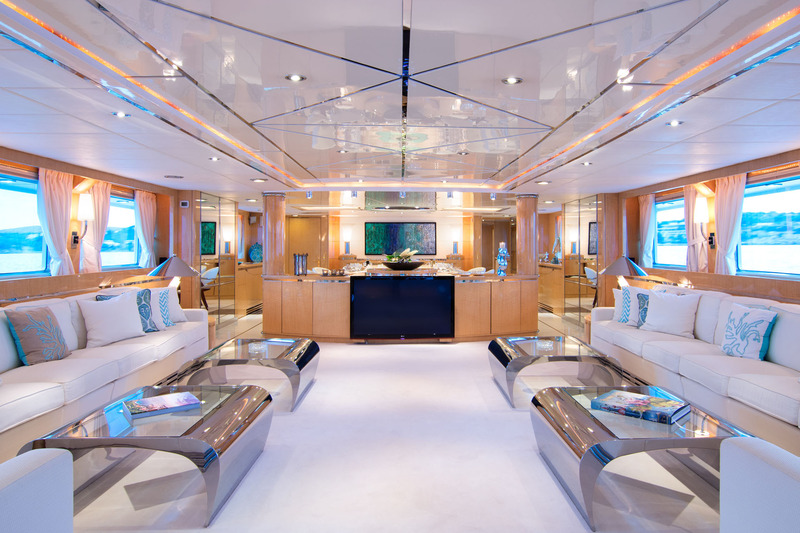 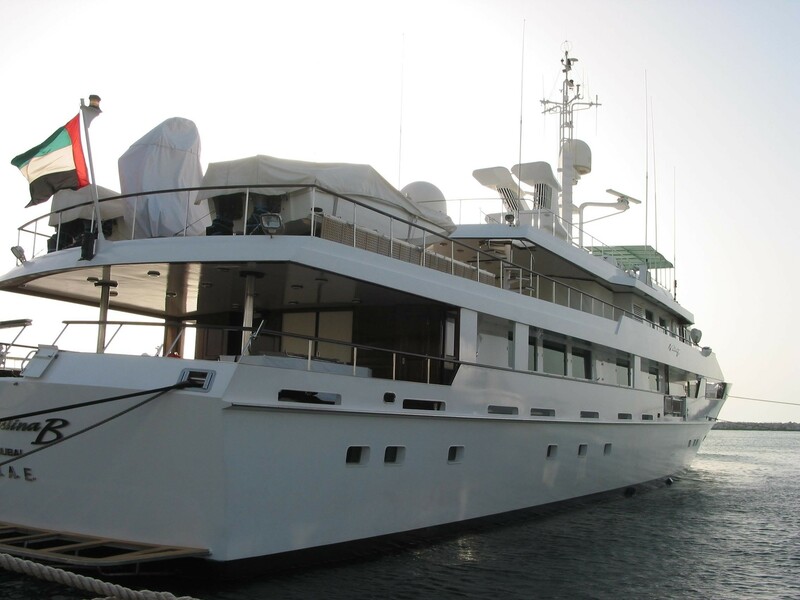 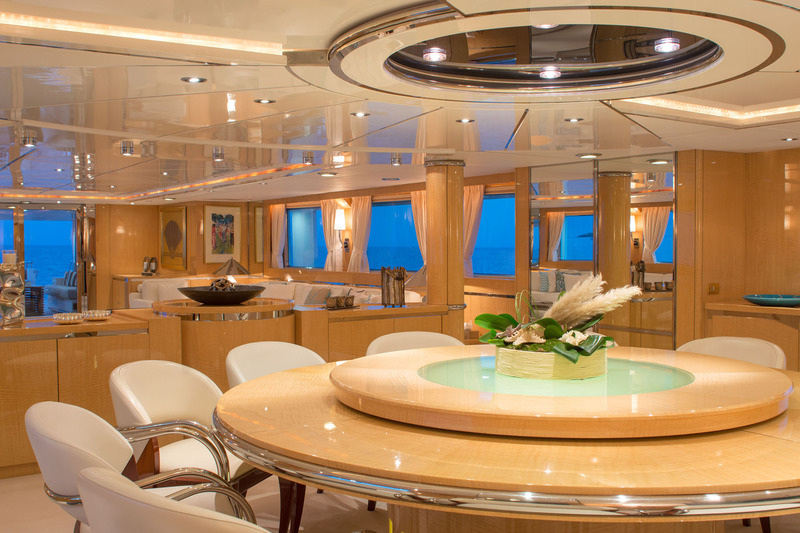 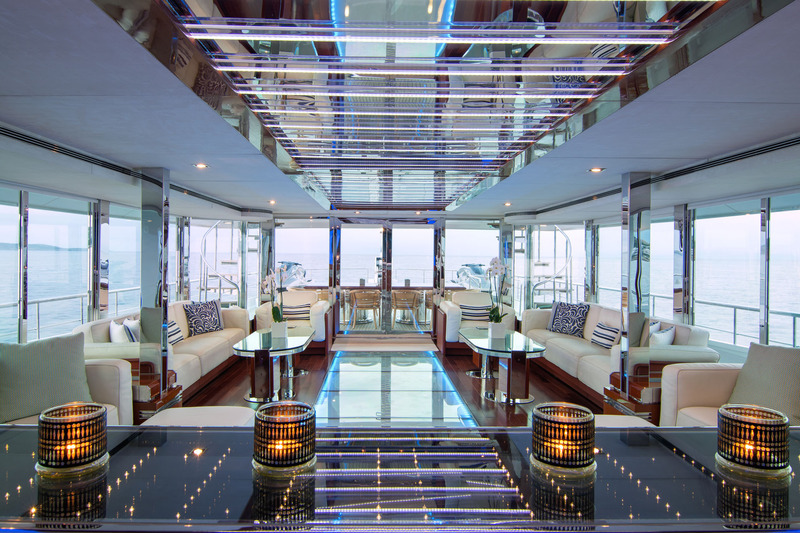 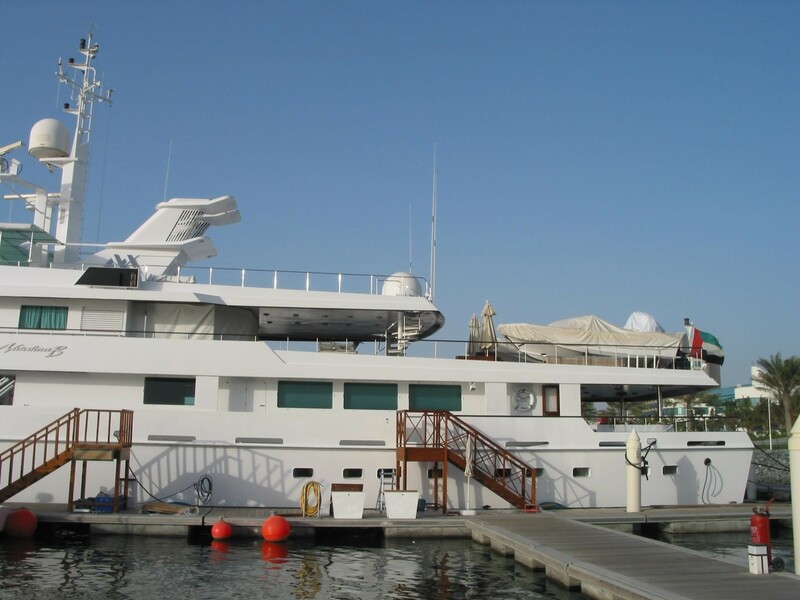 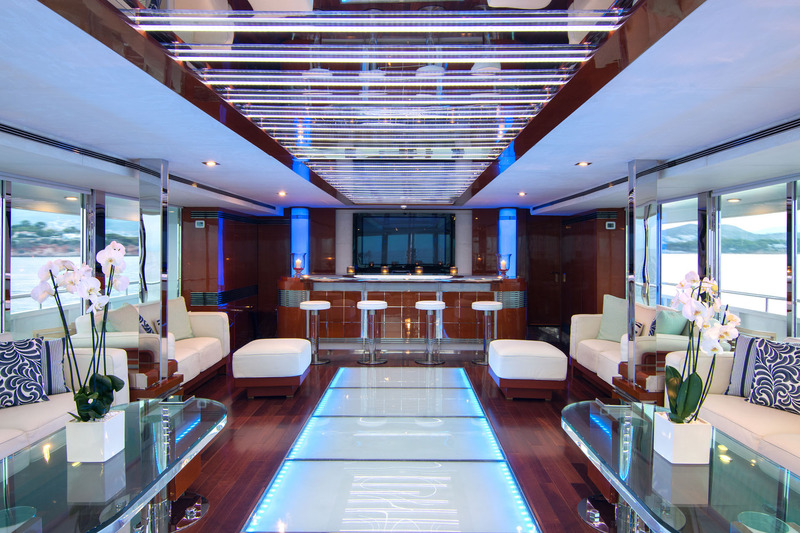 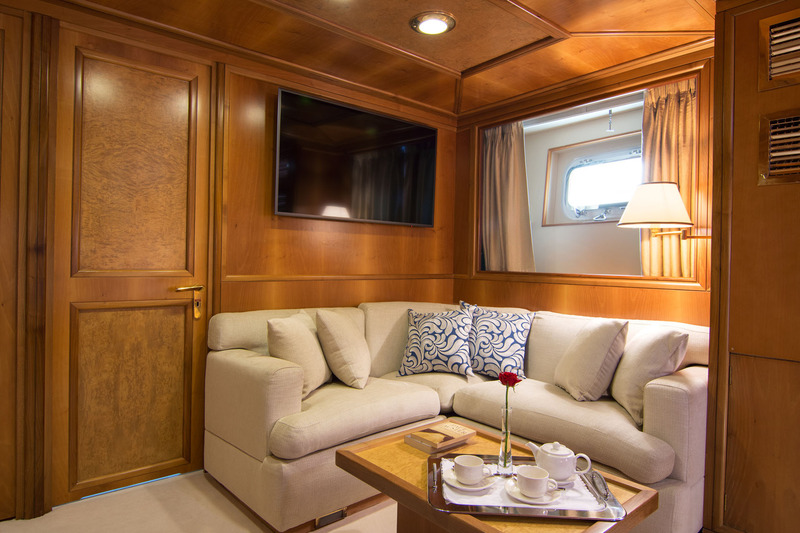 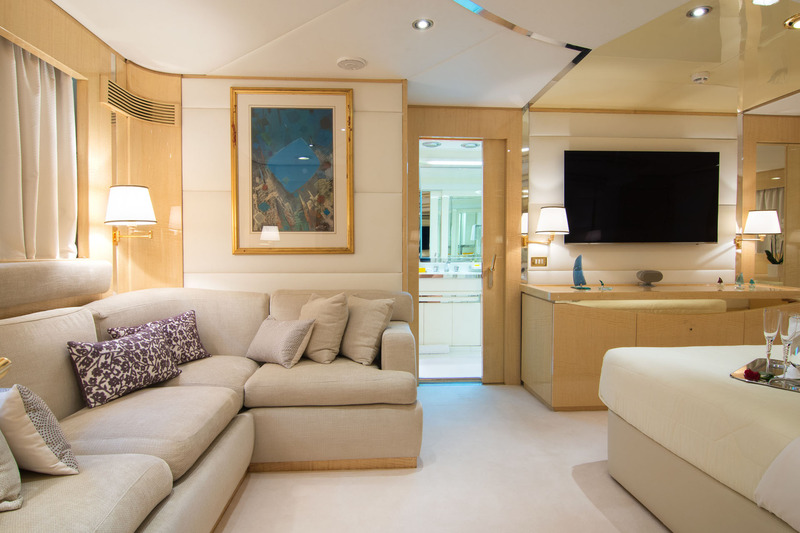 Behind, there is a widescreen TV and are two sofas along the port and starboard sides for plenty of natural light. 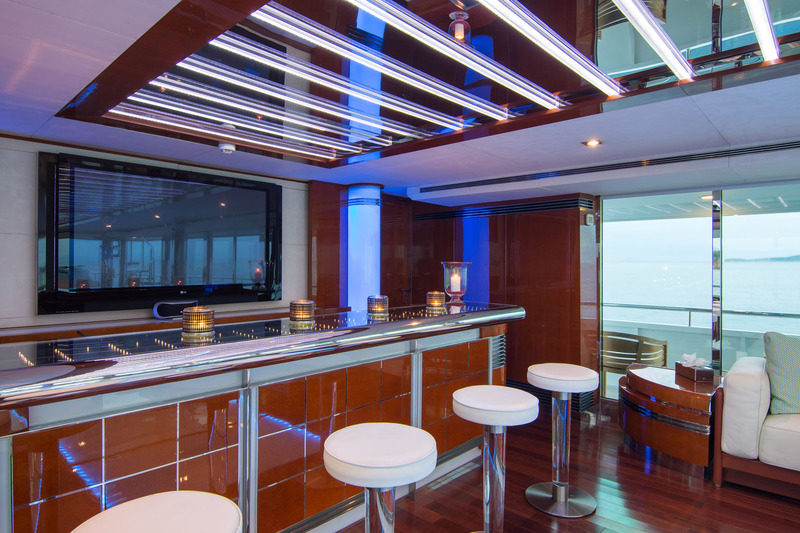 The skylounge uses darker wooden panelling for a sophisticated environment that enhances the pale blue lighting on the floor and behind the forward bar. 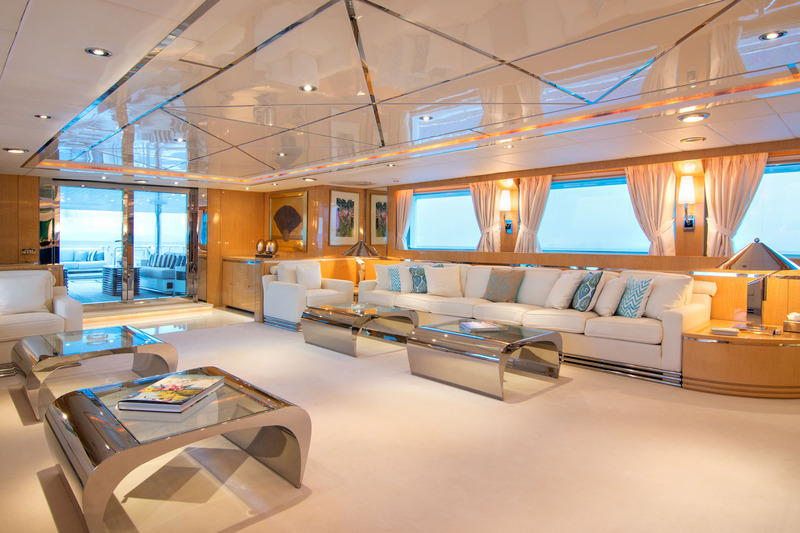 Close to the windows there are two plush sofas with coffee tables and footstools on each side, leaving the central area clear as a dance floor. 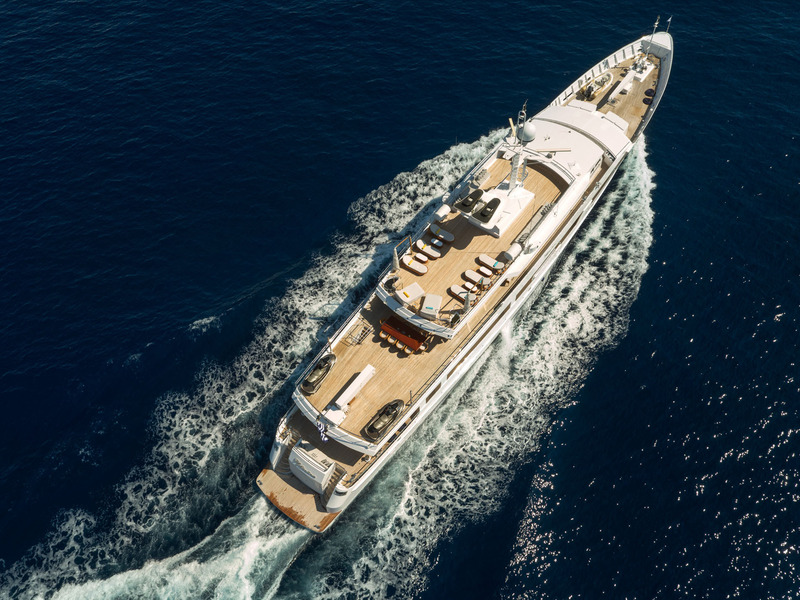 2 x 1180 HP MTU engines produce a top speed of 16 knots, a cruising speed of 14 knots and an impressive range of 8,000 nautical miles 12.5 knots. 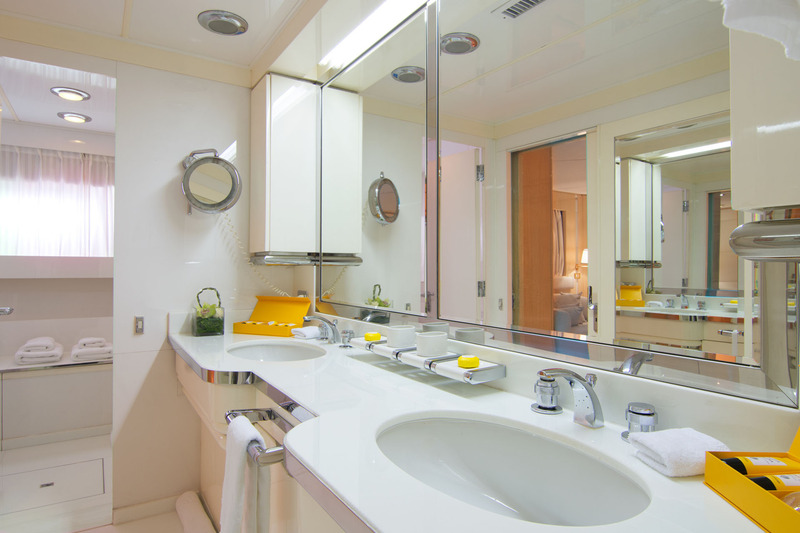 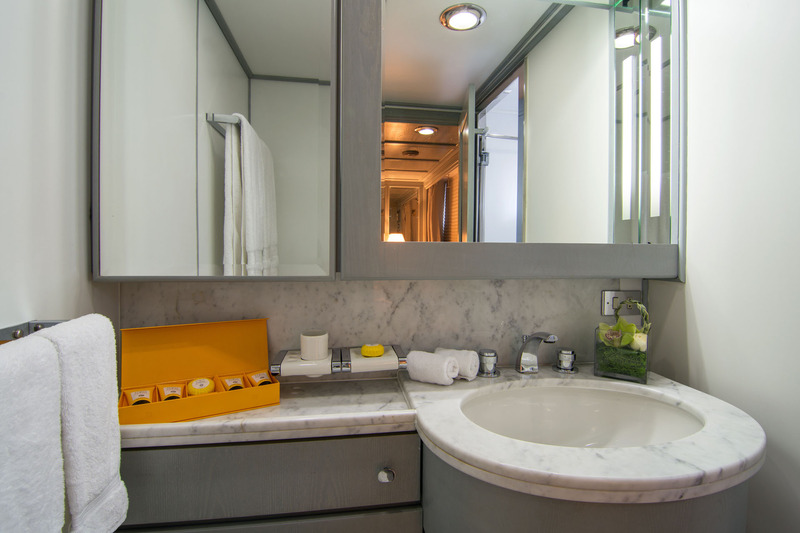 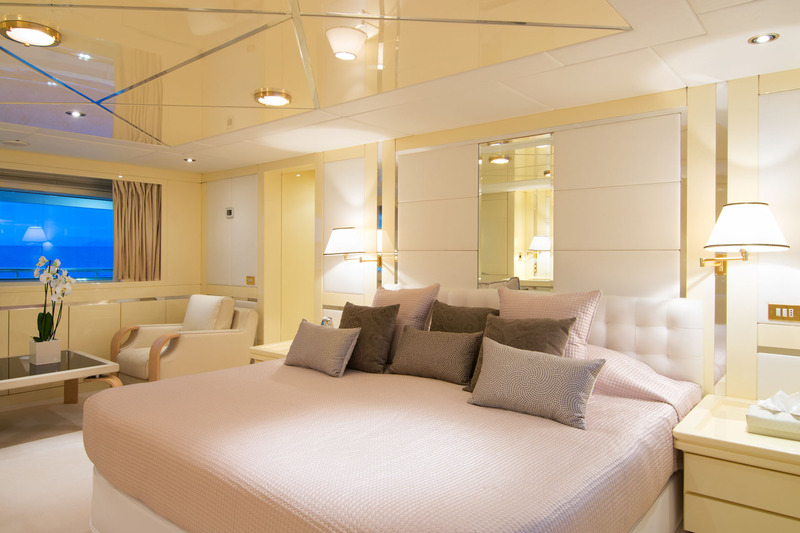 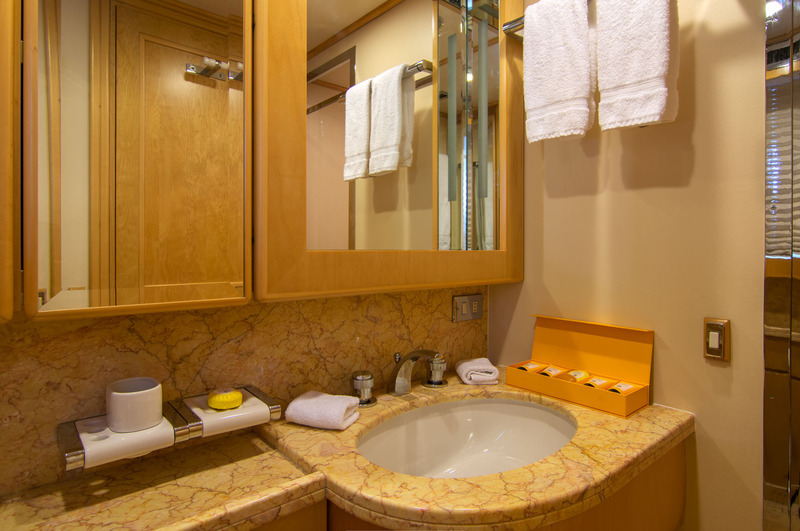 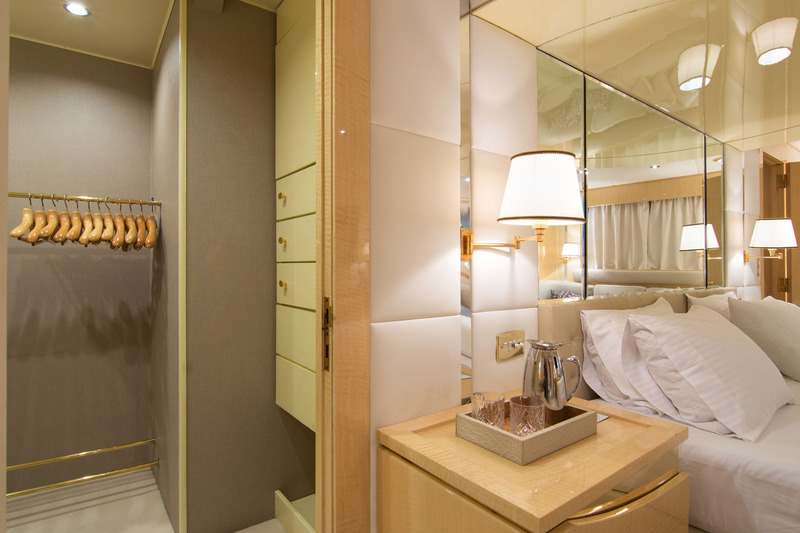 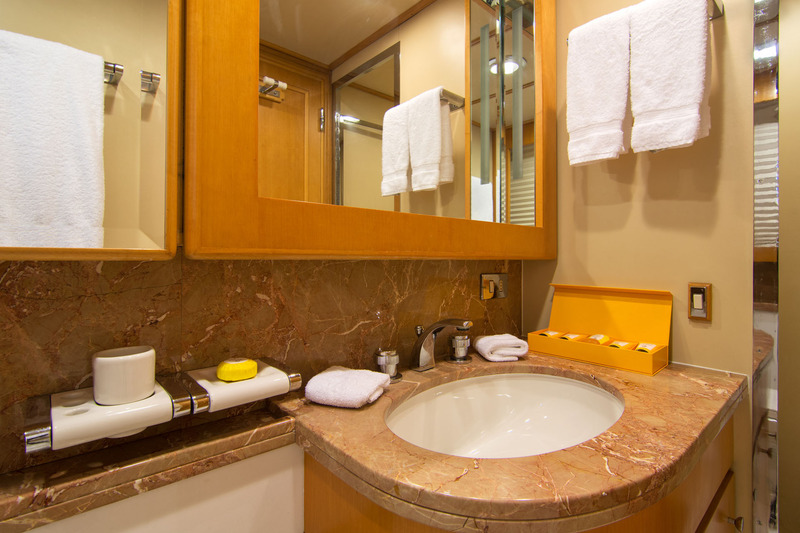 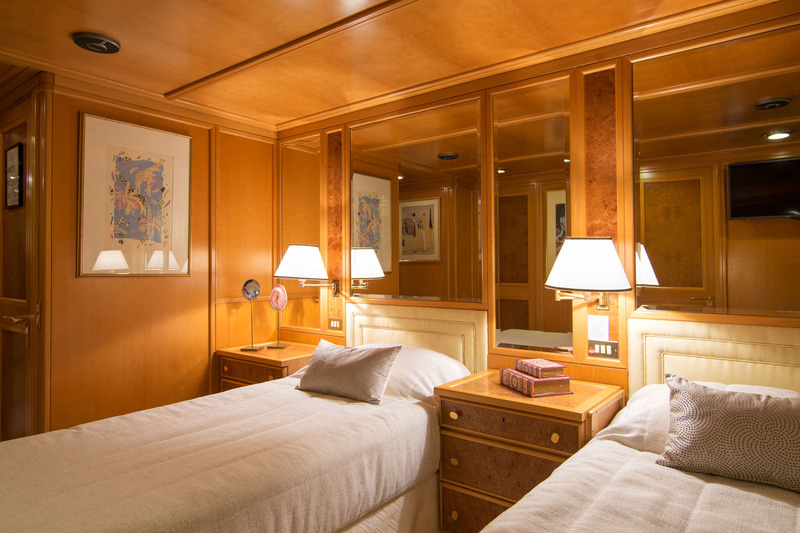 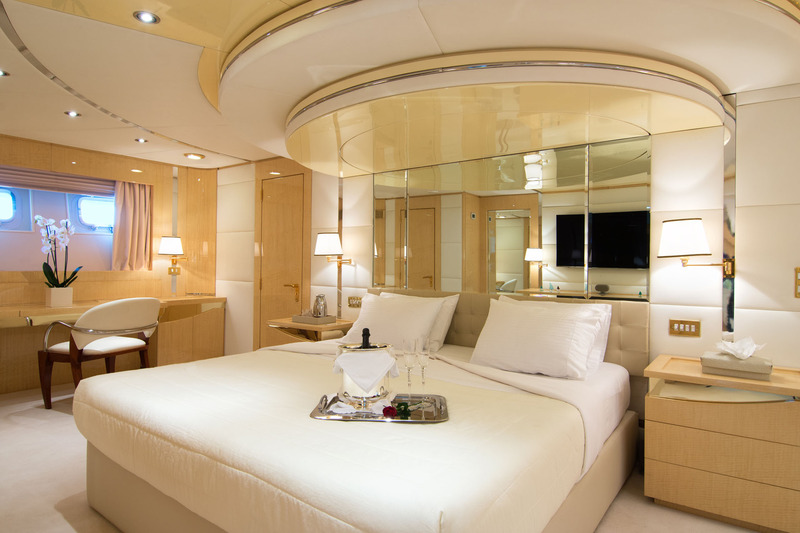 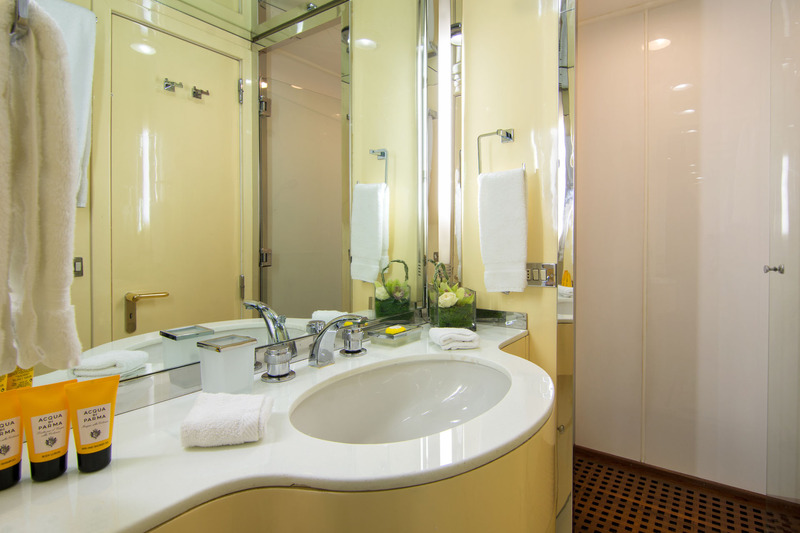 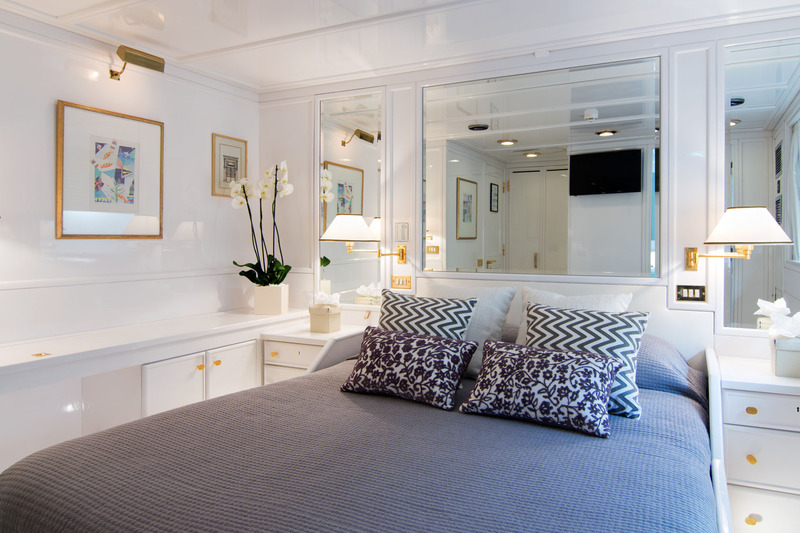 The accommodation sleeps up to 12 guests over 7 cabins: 2 Master suites, 3 VIP staterooms and 2 twin cabins. 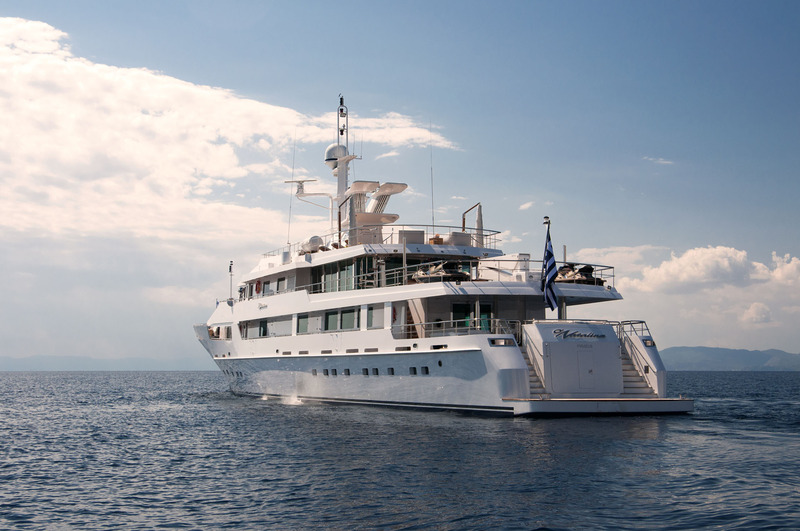 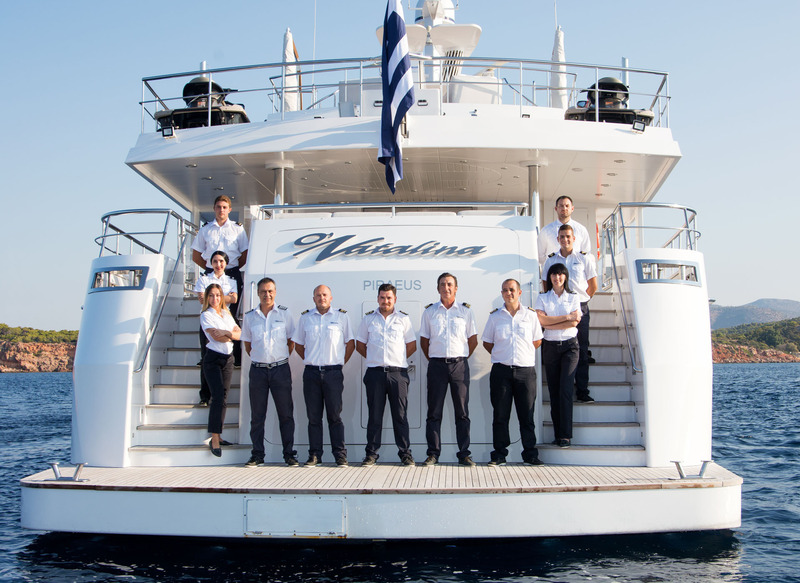 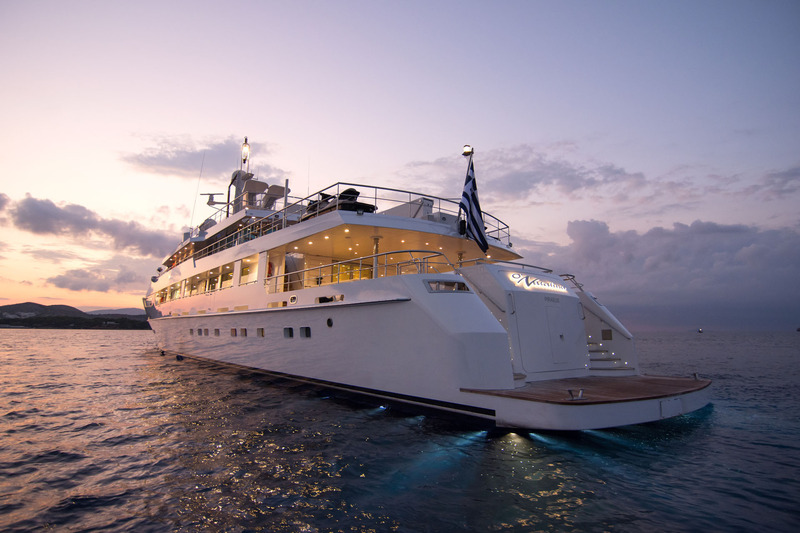 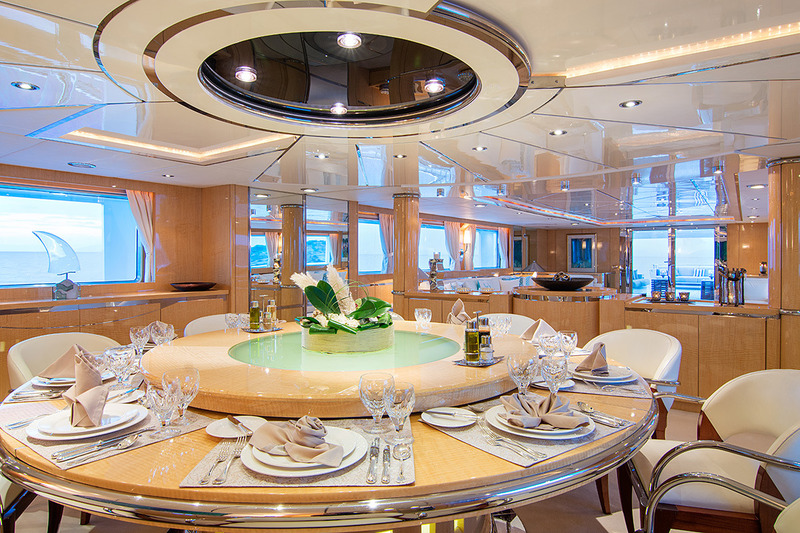 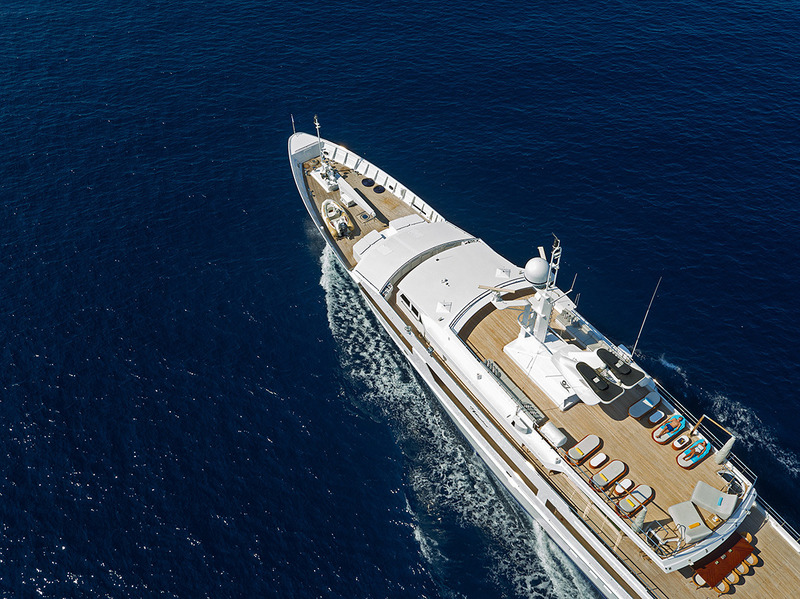 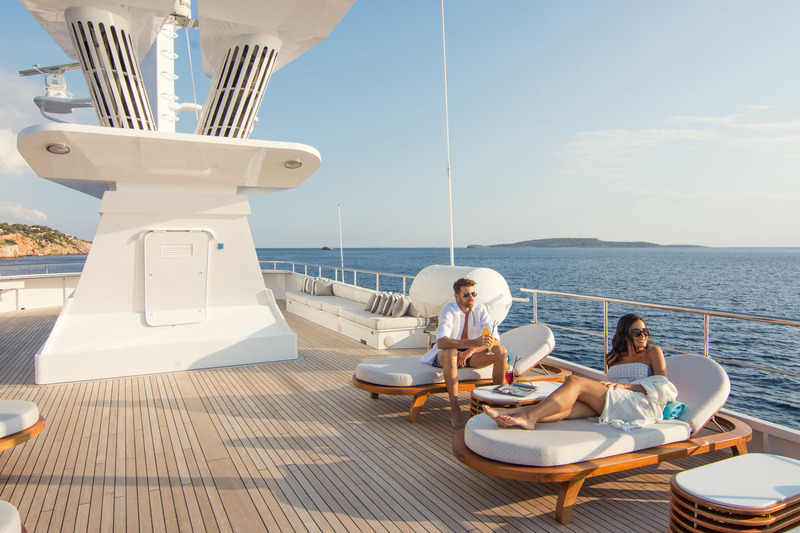 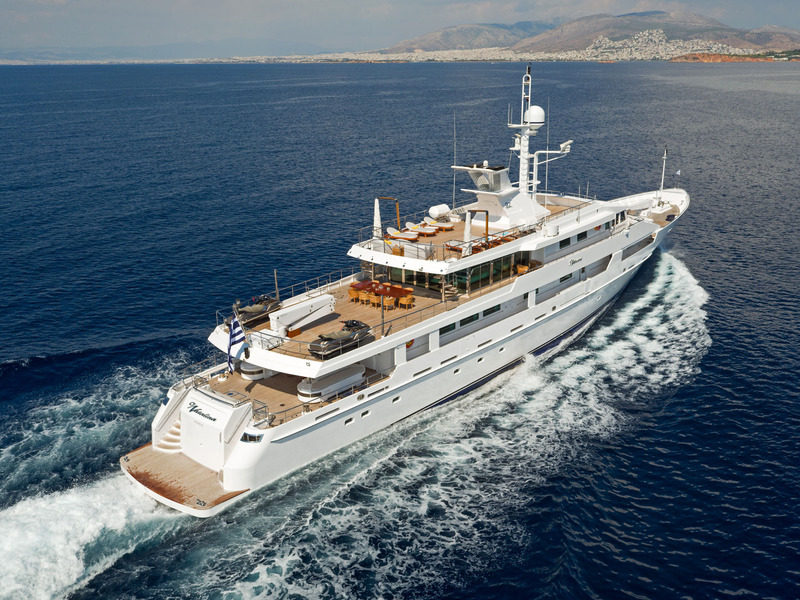 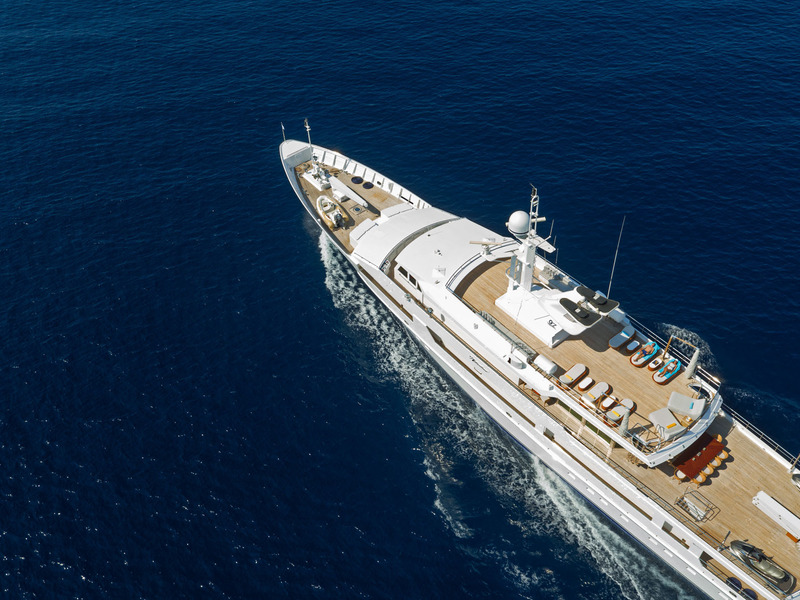 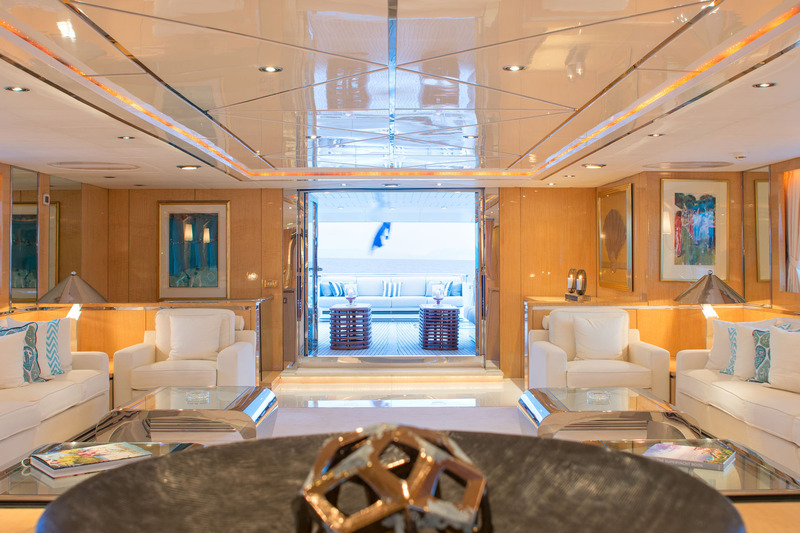 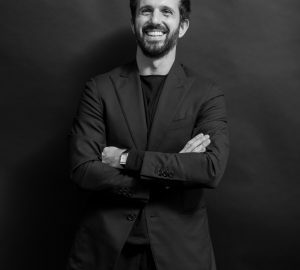 The professional crew of 11 will provide first-class service to all guests on board.